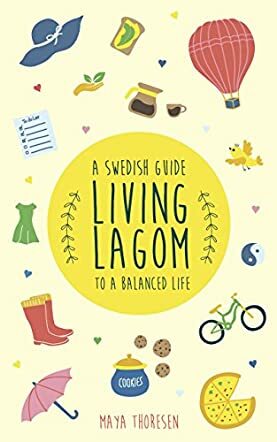 Living Lagom: A Swedish Guide to a Balanced Life by Maya Thoresen takes a closer look at the Swedish concept of Lagom and shows how it can be adopted by anyone who wishes to live a healthy and balanced life. In the book, Thoresen considers different components of an individual’s life such as their social life, what they eat, their family and their career. The idea is to do things moderately and not to overindulge so that all areas of life remain balanced. Thoresen also explores the relationship between Lagom and the Danish concept of Hygge. She explains how living a Lagom lifestyle encourages one to live a peaceful and happy life. Included also are great Swedish recipes that are healthy and simple to prepare. Unlike in other parts of the world where introversion is frowned upon, Thoresen explains how spending time by yourself, when done in moderation, could be a great way to slow down and reflect. Other great features of the book that I appreciated were the inclusion of practical ideas that can be applied by anyone. One such idea is spending time in nature or going out with friends once in a while. I also liked the idea of purposeful spending and cutting back on unnecessary items in the home. The breakfast, lunch and dinner recipes included were also an invaluable addition to the book and they expanded my scope of possible healthy dishes that I can prepare. Living Lagom by Maya Thoresen is enlightening and hence recommended.